Namibia and specifically the southern part of Namibia is one of the wonderlands of Southern Africa. Indigenous desert “forests” with ancient trees (“halfmens”), mountains combined with deep gorges, a rugged and fearsome coastline, fascinating vegetation and a rich animal & birdlife combine to create an area which since early on enchanted visitors. Keetmanshoop is a city in Karas Region, southern Namibia, lying on the Trans-Namib Railway from Windhoek to Upington in South Africa. The town is situated in a semi-arid area, normally receiving an annual average rainfall of only 152. Before the colonial era, the settlement was known as ǂNuǂgoaes or Swartmodder, both of which means “Black Marsh” and indicated the presence of a spring in the area. The first white settler, Guilliam Visagie, arrived here in 1785. When in February 1850 the Kharoǃoan clan (Keetmanshoop Nama) split from the Red Nation, the main subtribe of the Nama people, settled permanently here. In 1860 the Rheinische Missionsgesellschaft founded a mission there to christianize the local Nama. The first missionary, Johann Georg Schröder, arrived in Keetmanshoop on April 14, 1866, which is now marked as the founding date of Keetmanshoop. The mission station and city was named after the German trader and director of the Rhenish Missionary Society Johann Keetman who supported the mission financially. Lüderitz – The bay on which Lüderitz is situated was first known to Europeans when Bartolomeu Dias encountered it in 1487. He named the bay Angra Pequena (Portuguese: Small Bay) and erected a padrão (stone cross) on the southern peninsula. The town was founded in 1883 when Heinrich Vogelsang purchased Angra Pequena and some of the surrounding land on behalf of Adolf Lüderitz, a Hanseat from Bremen in Germany, from the local Nama chief Joseph Fredericks II in Bethanie. After the German World War I capitulation South Africa took over the administration of German South-West Africa in 1915. Many Germans were deported from Lüderitz, contributing to its shrinking in population numbers. From 1920 onwards, diamond mining was only conducted further south of town in places like Pomona and Elizabeth Bay. Duwisib Castle A castle is the last thing you would expect to see when you drive through the vast farm lands and deserts of Namibia. Duwisib Castle sometimes spelled Duwiseb or Duweseb is a grand pseudo-medieval looking fortress in the hills of the semi-arid Southern Namib region of Namibia. It was built by ‘Baron’ Captain Hans Heinrich von Wolf (born in Dresden in 1873), who was posted to the then German South-west Africa. The stand stones used for construction were carried approximately 2 km from the castle. Furniture was imported from Germany and stone masons were hired from Italy, Sweden and Ireland. This national monument consists of 900 m2 with a large courtyard and is today open to the public as a museum. 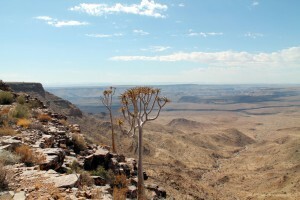 The Fish River Canyon is located in the south of Namibia. It is the largest canyon in Africa, as well as the second most visited tourist attraction in Namibia. It features a gigantic ravine, in total about160 km long, up to 27 km wide and in places almost 550 meters deep. About 650 million years ago (Mya), plate movement formed a north-south graben, or lowered area, along which the ancient Fish River could flow and eventually erode a flat plain, which is today’s upper canyon. 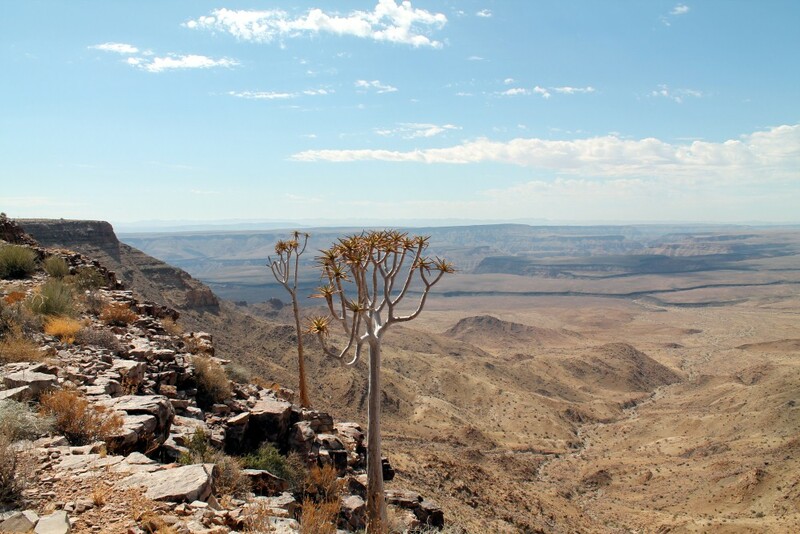 Glaciation at around 300 Mya, part of the Dyka glaciation during the Karoo Ice Age, further deepened the canyon. About 60 Mya, South America and Africa separated (due to continental drift) and Africa rose significantly; the consequentially increased gradient of the Fish River enabled it to erode the lower canyon into the hard gneisses, forming the current deeply twisting, meandering system of the lower canyon. The Fish River is the longest interior river in Namibia. It cuts deep into the plateau which is today dry, stony and sparsely covered with hardy drought-resistant plants. The river flows intermittently, usually flooding in late summer; the rest of the year it becomes a chain of long narrow pools. Kolmanskop is a ghost town in the Namib Desert in southern Namibia, a few kilometer’s inland from the port town of Lüderitz. It was named after a transport driver named Johnny Coleman. In 1908 the worker Zacharias Lewala found a diamond while working in this area and showed it to his supervisor, the German railway inspector August Stauch. Realizing the area was rich in diamonds; German miners began settlement, and soon after the German government declared a large area as a “Sperrgebiet“, starting to exploit the diamond field. Driven by the enormous wealth of the first diamond miners, the residents built the village in the architectural style of a German town. It had a railway link to Lüderitz. The town declined after World War I when the diamond-field slowly exhausted and was ultimately abandoned in 1954. The geological forces of the desert mean that tourists now walk through houses knee-deep in sand. Kolmanskop is popular with photographers for its settings of the desert sands’ reclaiming this once-thriving town. The Namib Desert Horse is a rare feral horse found in the Namib Desert of Namibia, Africa. It is probably the only feral herd of horses residing in Africa, with a population ranging between 90 and 150. The Namib Desert Horse is athletic in appearance, resembling the European light riding horses from which it probably descends, and usually dark in color. Despite the harsh environment in which they live, the horses are generally in good condition, except during times of extreme drought. The horses have been the subject of several population studies, which have given significant insight into their population dynamics and ability to survive in desert conditions. The dolorites at the quiver tree and giant’s playground forest near Keetmanshoop form part of the bigger sill complex. The dolorites are magma that was pressed up, but cooled off just below the earth’s surface. The softer parts of the stone and the top layer of the earht’s crust erodated away, which left the dolorites exposed. The dolorites are between 160 and 180 million year old. 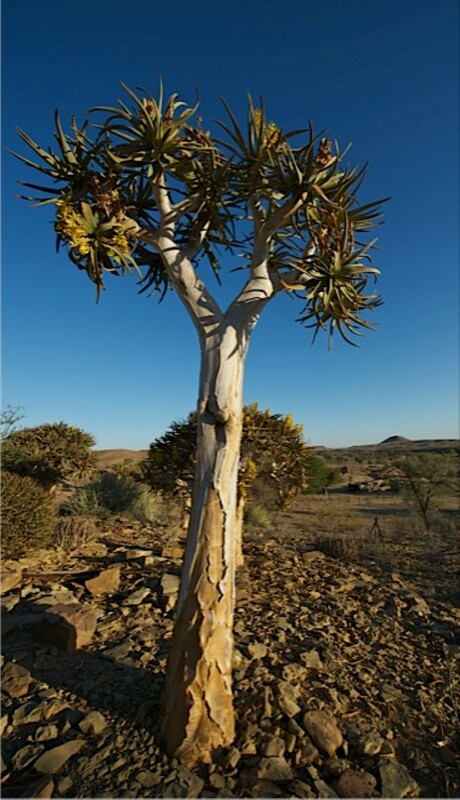 The quiver tree mostly occurs in black rock formations (called “ysterklip”) which absorbs a lot of heat during the hot summer. (Average summer temp. is 38°C). The rocks anchor the plants which have a spread-root-system. The trees in the forest near Keetmanshoop are natural. No trees have been planted by humans. 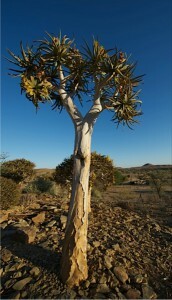 The quiver tree forest was declared as a national monument on 1 June 1955. The big trees in the forest are between 200 and 300 years old.